You'll learn to create Script files (MATLAB code) and execute them. A Script File is a user-created file with a sequence of MATLAB commands in it. You're actually creating MATLAB code, here. The file must be saved with a '.m' extension, thereby, making it an m-file. The code is executed by typing its file name (without the '.m' extension') at the command prompt. Now you'll write a script file to draw the unit circle of Tutorial Lesson 3. You are essentially going to write the same commands in a file, save it, name it, and execute it within MATLAB. Create a new file. On PCs, select 'New' -> 'M-File' from the File menu, or use the related icons. A new edit window appears. interpreted as comments and are ignored by MATLAB, but are very useful for you, because then you can explain the meaning of the instructions. 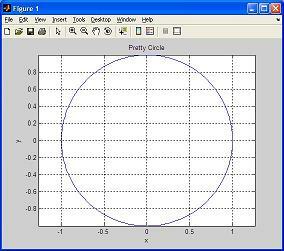 Write and save the file under the name 'prettycircle.m'. On PCs select 'Save As...' from the File menu. A dialog box appears. Type the name of the document as prettycircle.m. Make sure the file is being saved in the folder you want it to be in (the current working folder / directory of MATLAB). Click on the 'Save' icon to save the file. Now go back to the MATLAB command window and type the following command to execute the script file. And you achieve the same 2D plot that you achieved in Tutorial Lesson 3, but the difference is that you saved all the instructions in a file that can be accessed and run by other m-files! It's like having a custom-made code!